Extend Intel® Virtualization Technology (Intel® VT) beyond server virtualization to the network with hardware optimizations and offloads for the rapid provisioning of networks in an agile data center. Intel continues its legacy of Ethernet leadership by introducing a 10/40 gigabit family of adapters powered by the Intel® Ethernet Converged Network Adapter XL710. 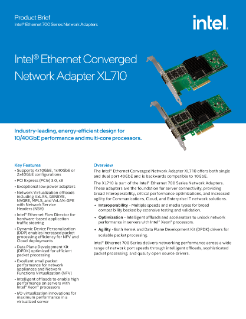 The Intel® Ethernet Converged ...Network Adapter XL710 addresses the demanding needs of the next-generation agile data center by providing unmatched features for both server and network virtualization, flexibility for LAN and SAN networks, and proven, reliable performance.